On our last full day in Lisbon Son and I woke up feeling queasy and off colour. Unsure what caused this we had a lie-in, a late breakfast and didn’t venture out until 11.30. We still didn’t feel on top form but were well enough to keep to our original plan to visit Belem. Tram number 15 was our goal, it takes about twenty minutes to travel from Lisbon out to Belem and (more through good luck than good planning) we found ourselves at the first stop. We got seats but one more stop along the route the tram became incredibly full and it was standing room only. I was relieved we were seated. Standing packed like sardines for over 20 minutes looked like no fun at all. 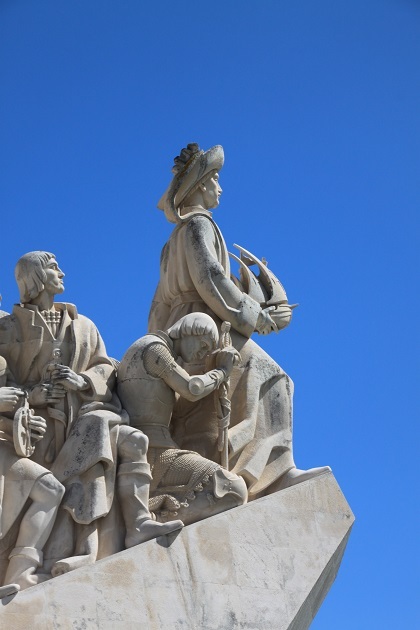 Belem is the place from where Vasco da Gama and other explorers departed on their travels. 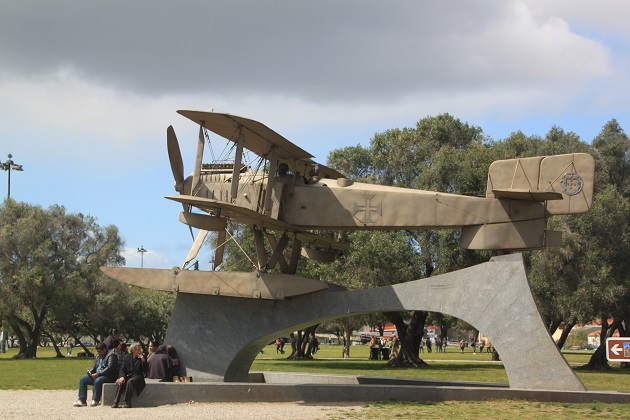 A lot of interesting history in this area means it is a must see if you are in Lisbon. We got off the tram at the stop for Monasteiro dos Jeronimos. Easy to find as the building is just stunning and the most beautiful example of Manueline architecture. A clever architect used small columns to support that vast roof and it withstood the 1755 earthquake. The vast majority of Lisbon’s large buildings collapsed, this one only had very slight damage. We admired the stunning architecture from outside then went into the church. Free to enter but there is a charge for the monastery. 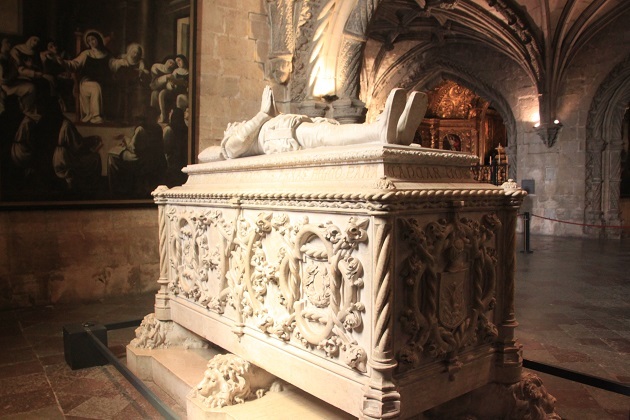 The church has some elaborate decoration, the choir stalls are particularly impressive and we spied the tomb of Vasco da Gama. Back outside and dodging the multitude of hawkers who tried to push all manner of things onto us, we crossed the road to take a closer look at the Monument To The Discoveries. 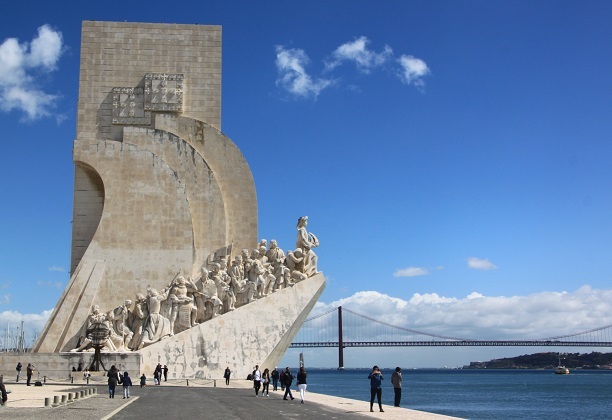 Such an imposing monument on the banks of the river, it pays homage to the adventurers and explorers who helped establish Portugal as a super power in the 14th century. It dominates the shoreline and is in the shape of a ship with its sails blowing in the wind. Lots of historical figures, explorers and crusaders are featured and the square in front has a mosaic representing a compass, the map in the middle shows the route the explorers followed. The monument is spectacular but so are the views of the river and the bridge in the background. 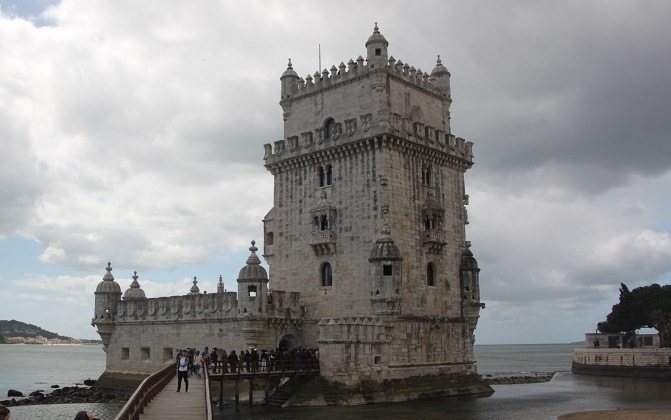 A short stroll along the water is the Belem Tower, we decided to look from the outside and avoid the entrance charge. Built in 1515 to protect the city from raiders, it is beautiful and intricate. Walking back to the tram Son was quick to spot a crepe stall – something he cannot go past, this one got a thumbs up. A couple of tram stops later we got off again at the Casa Paseis de Belem. You can’t miss this place either, just look for the bakery with a huge line outside. Apparently the queue is a common feature. 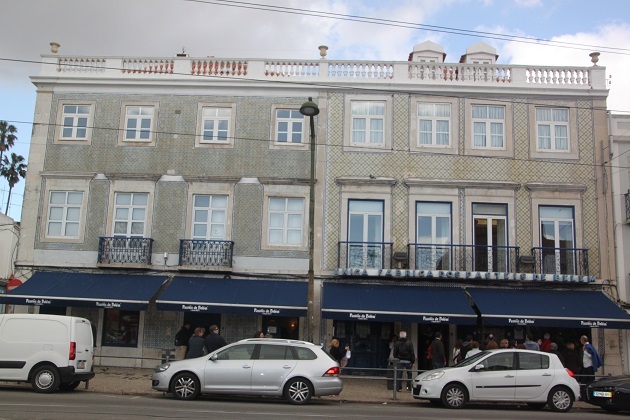 This is the traditional home of the Pastel de Nata, a custard tart sprinkled with cinnamon. 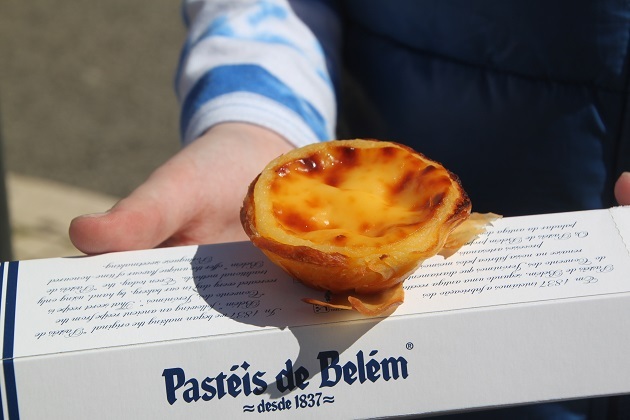 The cafe and bakery has been selling these for over 150 years, you just can’t come to Belem and not have one of these. The line moved fast, we chose to buy tarts to take away. They were warm, just out of the oven and sprinkled with cinnamon and sugar – mouth wateringly delicious. This was the perfect way to end our trip to Belem. 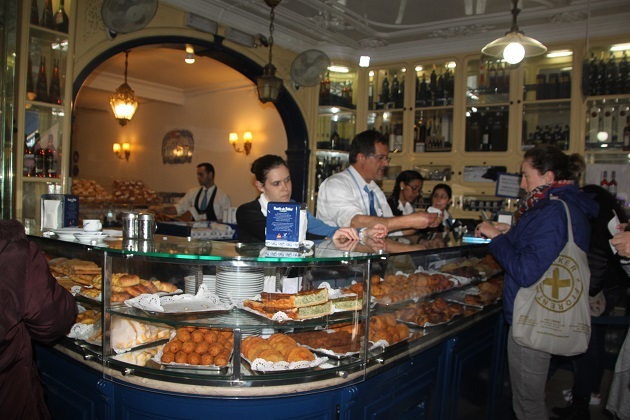 did you like pasteis de belem cake? Oh yes – so much!! Stomach problems overcome by crepes! Sounds a good cure. It worked for him!! He was right as rain after that crepe! That’s a shame, but gives you a good excuse to revisit Lisbon. Sorry about including the photo in the comment, I thought it would just post the link! Sorry to read that you weren’t feeling your best on your final day in Lisbon. 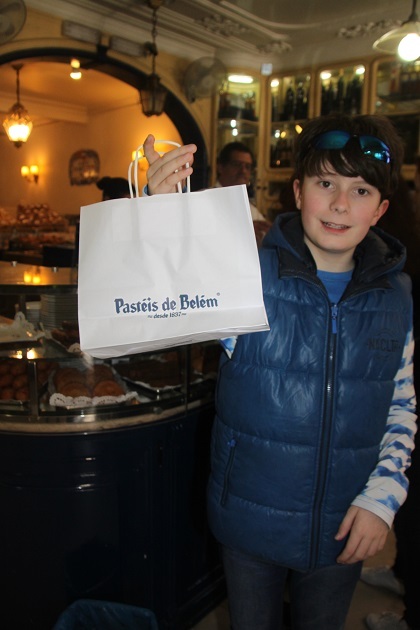 I loved Belem too so I’m glad you felt well enough to visit this district and, of course, we visited the same bakery for those delicious Portuguese custard tarts, they are irresistible! M.
Drooling just thinking about those tarts right now Marion!! It’s worth a visit for sure – we loved it!! Hope you get there sometime. And now that I’ve seen your posts, Lisbon is committed to memory. That and speaking the language. Be good Joy. Belem looks like such a picturesque area of Lisbon – definitely an area to keep in mind for when I eventually make it over to that corner of Europe. I’m not a custard tart fan, but those do look very tasty!! Custard tarts normally wouldn’t be my first choice either but these were so delicious – if you go there definitely try them!! It is a really interesting and beautiful area to explore – the views over the river are stunning too. They sound like a must-eat for that area, so I’ll definitely give them a whirl if I find myself there! That is definitely my sort of day out. Lots of history, fascinating buildings, delicious treats, and public art. I am sorry you were feeling so unwell though. It’s extra horrid when that happens during a vacation. We both felt really queasy that day, still at least it was our last day and we were still able to visit Belem. We didn’t spend as long there as I would have liked but we definitely got a feel for Belem and all its monuments and historic buildings. Lovely pics! Looks like a place well worth a visit. 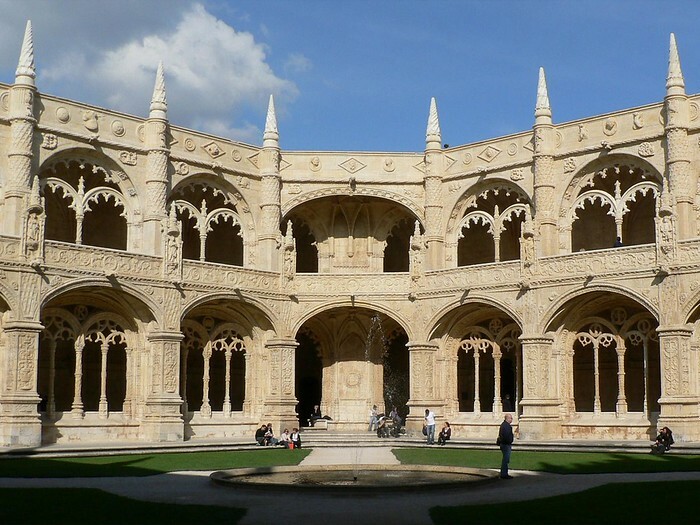 It is so interesting and very beautiful too – definitely a part of Lisbon worth seeing. Oh yummy…I’m drooling at the custard. When I lived in Tokyo, I always bought from the store (more like a stand) close to our house that sells Portuguese custard (looks a lot like the picture you have here). We weren’t too bad really, and I’m grateful we were still able to visit Belem despite the queasy stomachs!! These custard tarts probably tasted exactly like the ones you had – sooo delicious! That monument looks very cool! And I am not at all a fan of custard (in fact, I hate it), but your photo does make those tarts look very flaky and tempting; I’d think I’d probably at least have to try one! They are delicious, my Husband is not a custard fan at all but he devoured two of these. Freshly baked and still warm they are definitely worth a try! I’ve really enjoyed reading all about your adventures in Lisbon! So many great ideas to add to our list when we visit next year! Do you mind telling me the name of the tour you went on that took you to Sintra and the coast? Thank you Kelly! We booked through the viator website – viator.com. 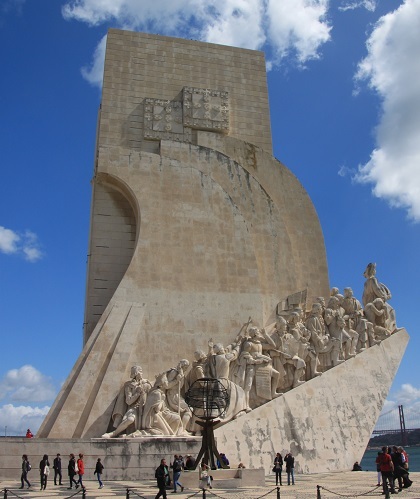 If you search Lisbon it is the first tour – Sintra and Cascais Small Group Day Trip From Lisbon is the name. Hope you enjoy it all as much as we did – I’m sure you will!! Those tarts look delicious – sounds like you guys wound up feeling much better by the end of the day! We definitely did Corey – maybe the tarts helped!! They were definitely delicious. 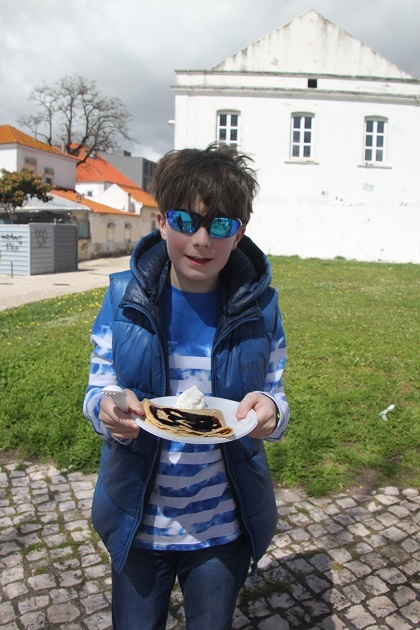 He is always up for a crepe Rosemary and we loved the custard tarts. It is such an interesting place to explore, lots of wide open space but loads of history, gorgeous buildings and fascinating monuments. Hope your weekend is a good one too. This was one of my favorite areas in Lisbon! My older son loved the little custards, but he was the only one. Looks like you had a fabulous blue sky! We had lovely blue skies but it was so cold – we weren’t prepared for the chilly weather we had that day!! I loved the custard tarts, so did my husband but our son wouldn’t even try one. I just about got him to hold one for the picture! 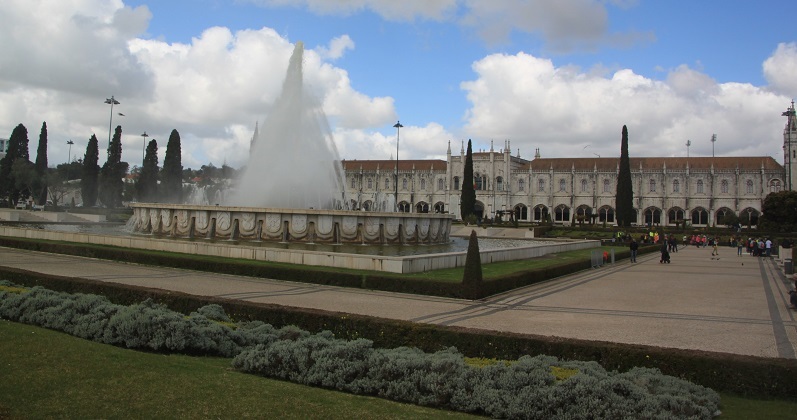 Belem seems exceptional and such a great travel destination, Joy! 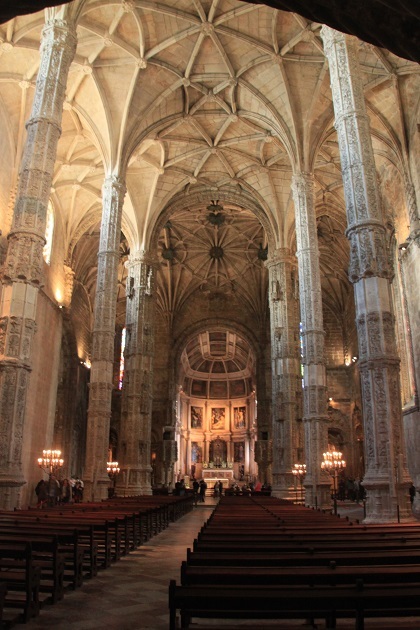 I especially love the architecture of Monasterio dos Jeronimos. Is the inside as beautiful as the outside? It is a gorgeous part of Lisbon, we loved it there. Looks beautiful. 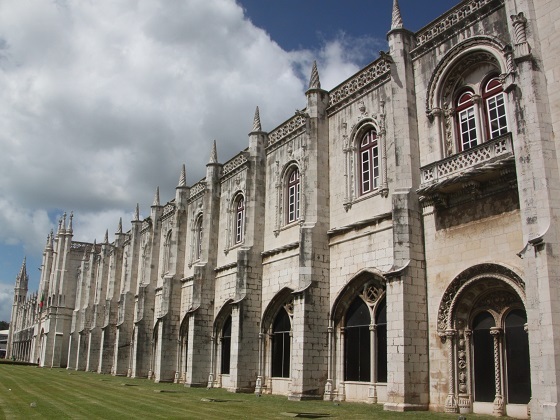 We’re hoping to get to Portugal next month so we’ll keep Belem in mind. 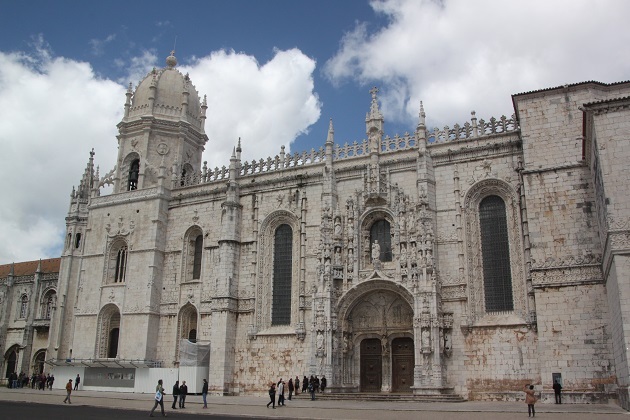 It’s an easy journey from the centre of Lisbon and well worth a visit – so much history and interesting things to see.